You might call it evolution - my wife Ghislaine, being a school teacher, is constantly remarking how rude the youth of today is. These kids have the gall to talk back to their teachers in a manner which in our day would have been certain to earn half a dozen whacks across the palm of our hand from the Headmaster's cane - and no, rubbing walnuts on your hand prior to the punishment does not ease the pain in the slightest! I was sitting quietly reading in my living room the other evening, and from upstairs I could hear the thump-thump-thump of very unmelodic music blaring out. I had the urge to grab a broomstick and bang on the ceiling at the same time as shouting "Turn that bloody racket down!" But I pulled myself up short and remembered that, when I was 15, listening to Eddie Cochrane, Buddy Holly, Elvis Presley and Tommy Steele et al, my father used the broomstick method on me! Truly this is an example of "What goes around comes around!" Talking of when I was 15... Friday night was ATC night in Chepstow, some 5 miles from where I lived. My mother always ensured I had the bus fare for the return trip - 2 shillings. So I hitchiked to Chepstow and the 2 shillings was spent on 5 Woodbines before the meeting and cod & chips with a couple of pickled onions afterwards! Delighted to hear from you, I remember you well and found a picture of you in my archives. No doubt we have all changed a great deal, at least on the outside! I left the RAF in October of 1974 and decided to go back to College and take a teaching qualification. On completion of my course at Culham College, Abingdon, in 1977, I returned to my home in the Isle of Man. Fortunately the Gods smiled on me and within three years I was appointed as a Headteacher, a position I held until I decided to retire in 1992. Quite a lot has happened in the intervening period, a foray into politics, a regular place on the Island's lecture circuit, the taking of the odd pint, etc. I'll write at length shortly and will be signing up for your organisation. Recently I was in Hong Kong with Gus Hatter, Don Hunter, and Jim Gallagher, as you would guess many miles were flown and several bottles demolished! I'll send on their E Mail addresses ASAP. In June of '66 I was posted to Salalah in Oman. 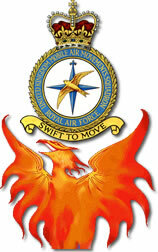 Most of C Flight, 3 Squadron, 50th Entry, Boy Entrants, ended up in the Middle East at that time. Anyway, Salalah was a very small staging post, there being only about 50 regular RAF people at any given time. There was a sand runway, a few tin huts and some other buildings that served the needs of the chaps in the tin huts, and that was that. We had no doctor at the base, so if one contracted an illness of some description, then a 1,400 mile round trip to Aden was called for. Aden was a paradise in some respects as compared to Salalah; they had real shops and lots of females walking around. Needless to say, strange maladies were reported by all on a seemingly very regular basis. Our haircuts were given by the Station Warrant Officer - who was only a Sergeant; the base was far too small for us to be entitled to a full W.O. I remember he was a member of the RAF Regiment and was of Scottish origin - Mac something - such a nice chap. We were under constant threat of guerilla attacks from dissident tribesmen and gun runners, and to this end had quite frequent readiness drills in order that we could "Man the Battlements" at a moment's notice. Ginger Anderson and I were assigned a bren-gun position atop the Public Works building. We would alternate between shooter and loader/gofor each time. Anyway, "Mac something" would make the rounds after everyone was in position and offer up a target in order for the shooters to keep their skills honed. This one particular morning it was Ginger's turn to be the shooter, and I hauled up the ammunition and performed other small duties like making sure there were refreshments suitable to the time of day at hand. "Mac something" made his appearance in due course and it was determined that the cab of an old abandoned crane, about a mile distant, would be the target of choice. This crane was in a rubbish dump of sorts, all kinds of empty 45 gallon drums and old trucks were lying there. Ginger fired off between 20 - 30 rounds, every fifth round was a tracer, so the route of the ammunition was easily plotted. After two or three short bursts he was pretty much on target. Puffs of smoke could be seen dancing all around the crane. About a month later, a delivery was being made to the rubbish dump, and the remains of an Arab were found hanging out of the crane cab. Some poor unfortunate sod had made this his accommodations for the night once too often! Murdo, Murdo, Murdo - tied one on and wrote to me - heh heh heh! For all of us who were Boy Entrants at one time, I have added "Ode to Boy Entrants" to the Humour page. I understand it was written in the 1950's - but it is timeless for most. Mark Postlethwaite, aviation artist, has very kindly allowed us to portray his piece "First In - Last Out, UKMAMS team unloading a Hercules, Gulf War 1991"
I am in the process of developing an article which shows this beautiful picture, which is already in the Articles pages for those who want to see it. However, I really need some input from members regarding UKMAMS involvement in the Gulf War. If anyone has an article, or would like to write something - anything, please forward it to me. Of course a picture says a thousand words, so if you don`t want to write - just send me some photographs! "To Tip Or Not?" Might be something you ask yourself after having received a questionable level of service or food quality in a restaurant. In this case it is neither - take a look at the aricle by the same name to see a dramatic photograph and discover the story behind the headline. I thank you genuinely, for letting people know that I will maybe be unavailable. It is difficult having to put up with doddery old berks like myself who can hardly tell what day it is. With regards to Canada and Northern Quebec, you should consider yourself lucky to be living there, you could be back in the UK! I rest my case. I genuinely think, that if I had done what I should have done when I was younger, I too would now be a Canadian citizen. But if I had done that, I would not have joined the RAF and had all the fun, experience and camaraderie that went with it. Ah yes! you say, but I could have gone there after. However, circumstances had changed, and who knows, one day you may get an unexpected visitor maybe, mon self on a visit to my second favourite country. I'll give you plenty of warning to give you time to escape. Should you get stuck up there in the wilds of northern Quebec, I wish you and yours a very Merry Xmas and a Happy New Year. Watching your page with interest. Added to the site is a Profile of John Holloway which is accessible via the Members page. A beautiful photograph has been added to the Images Page - depicting 5 of the 7 types of Transport Aircraft that were in service in 1969.